Apple was founded back in 1976 in a garage by Steve Jobs, Steve Wozniak, and Ronald Wayne. Apple started as a personal computer pioneer and now has emerged into making everything from laptops to portable media players. It has its head quarters in Cupertino, California. Apple entered the smart phone market by launching its first iPhone in 2007 later it launched ipad in 2010 and entered the tablet market, also has its name marked in smart watch market with Apple watch in 2014. 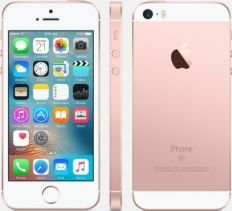 Apple iPhone SE was announced and released in March 2016. It is available in three variants such as Space Gray, Silver, Gold, Rose Gold. This phone comes with single sim slot that accepts a sim of nano size that supports the latest 4G connectivity for fastest internet and calling. iPhone SE’s display and design are crafted from bead-blasted aluminum for a satin-like finish. This light and compact phone is designed to fit comfortably in your hand and is build with LED-backlit IPS LCD, capacitive touch screen, 16M colors. It provides a screen size of 4 inches that equals ~60.8% screen-to-body ratio, provides a FULL HD retina display resolution of 640 x 1136 pixels that equals ~326 ppi(pixels per inch) pixel density. iPhone SE has an incredibly popular design and refines it even further. All the display features include LED-backlit Wide Screen Multi-touch Display, 326 PPI, 500 cd / m2 Maximum Brightness, Full sRGB Standard, Finger Print Resistant Oleo phobic Coating. This device has the dimensions 123.8 x 58.6 x 7.6 mm along height, width and thickness and it weighs about 113 g.
iPhone is packed with a Dual-core 1.84 GHz Twister processor one of the finest working processor, with a chipset of Apple A9 and the graphics provided by PowerVR GT7600 (six-core graphics) GPU. It has an A9 Chip with 64-bit Architecture and M9 Motion Co-processor which makes it different from other processors. This device works on an apple operating system iOS of version iOS 9.3.2 and has a planned upgrade to later versions. iOS 9 is the most advanced mobile operating system and the foundation of iPhone SE. It’s designed to look beautiful and work beautifully on your iPhone, so even the simplest tasks are more fun. iPhone has an unmatched experience of the powerful 2 GB RAM that will never ever slow down and provides the fastest ever multi tasking. One can easily activate Siri without picking up your phone, by simply saying “Hey Siri”. It has an internal storage of 16 GB for the user data and installation of apps and is also available in 64 GB versions. It has no expandable memory so there is no scope for an external SD card. iPhone has the most efficient camera manufactured at the Apple labs, it has the powerful 12 MP camera with f/2.2, 29mm, phase detection autofocus, dual-LED (dual tone) flash that captures every moment and make it live. This primary camera has the wide range of features like iSight Camera, 1.22 µ Pixels, Auto Focus, Live Photos, Focus Pixels, True Tone Flash, Panorama (Up to 63 MP), Burst Mode, Timer Mode, Auto HDR for Photos, Exposure Control, Five-element Lens, Hybrid IR Filter, Backside Illumination Sensor, Auto Image Stabilization, Improved Local Tone Mapping, Improved Noise Reduction, Sapphire Crystal Lens Cover, Face Detection, Photo Geo-tagging, Slow-motion Video, Time-lapse Video with Stabilization, Cinematic Video Stabilization, Take Still Photos While Recording Video, Playback Zoom, Zoom - 3x, Video Geo-tagging, Continuous Auto Focus Video. It has front facing camera of 1.2 MP that takes beautiful selfies. The iCloud stores all the images and videos you take and keep them updated in your device. This camera features HD Video Recording, Retina Flash, f/2.4 Aperture, Auto HDR for Photos, Backside Illumination Sensor, Exposure Control, Improved Local Tone Mapping, Burst Mode, Timer Mode, Face Detection. It has a video player that supports H.264, MP4, MOV, M4V, AAC-LC, MPEG4, AVI, MJPEG, PCM, Full HD, 4K - Ultra HD videos formats and a music player that supports WAV, AAX, AAX+, AAC, VBR, MP3, AIFF, HE-AAC audio formats. iPhone is powered by a Non-removable Li-Po 1642 mAh battery it provides a stand by time of 240 hrs (3G) and provides a standard talk time of 14 hrs (3G) and has music play time of 50 hrs. It has SAR value 1.17 W/kg (head), 1.19 W/kg (body). It has the support to 4G, 3G and 2G connections. It has the connectivity of WLAN and hotspot, Bluetooth, GPS and NFC but no FM radio. The sensors on this phone include Three-axis Gyro Sensor, Touch ID Fingerprint Sensor, Proximity Sensor, Ambient Light Sensor, Accelerometer, Digital Compass. It has some important apps like Health, FaceTime, Wallet, iTunes Store, App Store, iBooks, Game Center, Weather, Voice Memos, Stocks, Podcasts, Tips, iMovie, Pages, Keynote, Numbers, iTunes U, Garage Band, Remote, Music Memos, Find My iPhone, Find My Friends. This phone supports multiple languages, it’s features also include Mobile Network, Built-in Speaker, Microphones, Lightning Connector, External Buttons and Connectors: Touch ID Sensor, Volume Up / Down, Ring / Silent, On / Off or Sleep / Wake, Calendar, Notes, Reminders, Clock, Calculator, AirPlay Mirroring Photos, Audio and Video Out to Apple TV (2nd Generation), Video Mirroring and Video Out Support, Location: Mobile Data, iBeacon Micro-location, FaceTime Video Calling, Audio Calling - FaceTime Audio, Wi-Fi Calling, Multi-tasking, Quick Type Keyboard, Spotlight Search, Dictionary Support, Spell Check, Air Drop, Air Play, Air Print, Control Centre, Handoff, Homekit, iCloud Keychain, iCloud Drive, Notification Centre, Siri, Voice Input. The phone gives advance security for unlocking by Touch ID which though simple but secure. After all, your fingerprint is the perfect password no two are alike and you always have it with you. The only drawback noticeable with this phone is its screen size making a bit small when compared to other devices or even iPhone devices. Does the display has been provided in the Apple iPhone SE? 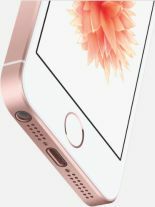 A 4‑inch (diagonal) LED‑backlit widescreen Multi‑Touch display has been provided in the Apple iPhone SE. The retina display provided in the phone has screen resolution of 1136-by-640 at 326 ppi. The display is protected by a Fingerprint‑resistant oleophobic coating. What are the various color options of the phone? The phone is available in four color variants i.e. Space Gray, Silver, Gold and Rose Gold. Yes, the phone provides NFC support for Apple Pay only. Is a fingerprint scanner provided in the phone, if yes where is it located? Yes, the phone does come with a fingerprint scanner, the scanner is embedded in the home button of the phone. The phone weighs 113 grams only. Can I fast charge the Apple iPhone SE? No, the phone doesn’t support fast charging. Yes, an earphone jack has been provided in the Apple iPhone SE. The phone comes with a Non-removable Li-Po 1624 mAh battery (6.21 Wh) that provides a stand-by up to 240 hours on 2G and up to 240 hours on 3G networks. The phone also promises a talk time up to 14 hours on 3G networks and music playback time up to 50 hours. How many sensors does the phone has? The phone comes with five sensors i.e. Touch ID fingerprint sensor, Three‑axis gyro, Accelerometer, Proximity sensor and Ambient light sensor. 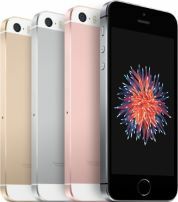 What kind of cameras are provided in the Apple iPhone SE? A 12 MP primary camera with f/1.7, 26mm sensor, Sapphire crystal lens cover, True Tone flash, Backside illumination sensor is provided in the phone. The rear camera sports a Five-element lens that provides 5x digital zoom, Live Photos with stabilization, Local tone mapping, and Face detection. The secondary camera is only 1.2 MP. What kind of video recording could be done by the Apple iPhone SE? Does it records Slo-Mo videos? The phone can record videos at frames like 4K video recording at 30 fps, 1080p HD video recording at 30 fps or 60 fps, 720p HD video recording at 30 fps. The videos can be recorded at 3x digital zoom backed by True Tone flash, Cinematic video stabilization (1080p and 720p) and Continuous autofocus video. Slow-motion video can also be recorded at frames like 1080p at 120 fps and 720p at 240 fps. Time-lapse video could also be recorded by the camera with stabilization. One can also take 8-megapixel still photos while recording 4K video.